The cooler weather we've been having has gotten me into the Christmas spirit early this year. I regularly have to remind myself that Halloween hasn't yet come and gone. Since the beginning of October, I've been dreaming of Christmas carols, sugar cookies and candy canes. As an almost newly wed, my collection of holiday decorations is still fledgling at best. We have no stockings, no tree skirt, no decorative wreaths and very few ornaments. And since the thought of buying decorations clashes with the (completely unrealistic) handmade holiday vision that has been dancing in my head, I have been planning a few projects that might inject a few handmade elements into our otherwise minimal holiday décor. Figuring that my husband wasn't quite ready to put up the Christmas tree and needing an outlet for my fixation, I decided to start working on a Christmas stocking last weekend. 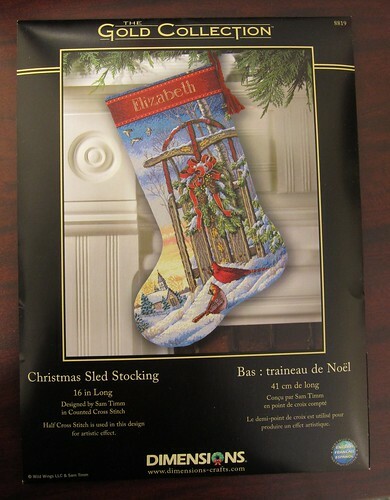 This is the Christmas Sled Stocking kit from the Dimensions Gold Collection Line that I bought last year. It was nice to finally get started with this and I managed to make quite a lot of progress last weekend since the thought of staying cuddled up on the couch with my husband and a movie won out over laundry and housework. This project also means that I am finally getting some use out of the Hoop Travel Bag I made a few months ago. 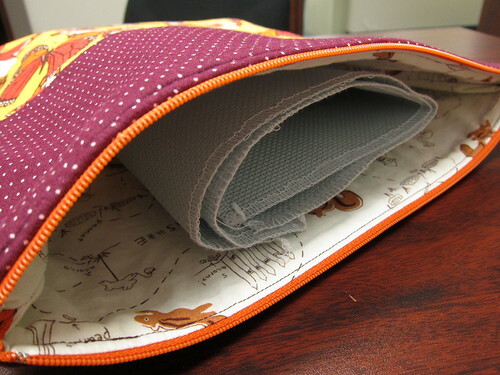 It is perfect for holding my embroidery projects and sewing notions. It was easy to make and with a bit of hand basting, I even didn't lose my cool while putting the zipper in. 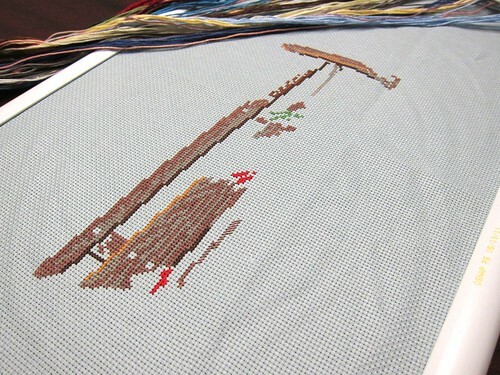 Part of me wants to make one of these for every project I am working on to help keep my numerous WIPs organized. After seeing this patchwork version made by Karen at make something, I just might!